Daniel Sanchez tried to help his high-A Prince William Cannons come back in this June 1991, but it wasn't enough, according to The Fredericksburg Free Lance-Star. Sanchez knocked two hits in the game, but his Cannons could only turn an early 3-0 deficit into a 3-2 loss. Sanchez got those two hits in his second season as a pro. He got into only one more campaign, his career ending without Sanchez reaching AA. Sanchez' career began in 1990, signed by the Yankees as an amateur free agent out of his native Dominican Republic. Sanchez was also referred to as Danny Sanchez. Sanchez played his first year between single-A Greensboro and the rookie Gulf Coast League. He got into 49 games at Greensboro, hitting just .218 with nine RBI. In the GCL, he got into another 14 games, going just 8 for 43. 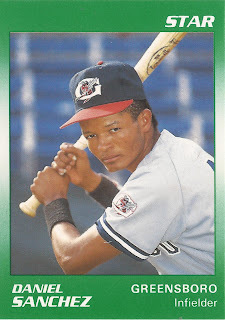 For 1991, Sanchez split 63 games between Greensboro and Prince William. He hit just .154 between them. In another June game, Sanchez reached base on a sacrifice error. That was the extent of his time in the Yankees system. Sanchez isn't credited as playing in 1992, but he is recorded as coming back for one final look in 1993. He got 26 games back in the Gulf Coast League with the White Sox, ending his career.